This course is for those who already have a current FAW or one that is no older than one month from expiry (3 years and 1 month). You must be able to produce a copy of your old certificate and give it to your instructor at the practical part of the course. Where you start your course online you will receive your certificate of completion and passing of the practical part two. Where you have a qualifying FAW, you can complete the course in just two days in the classroom or one day online and one day in the classroom. All our first aid courses fully meet the UK and European Resuscitation Council Guidelines 2015 as per the HSE requirements. 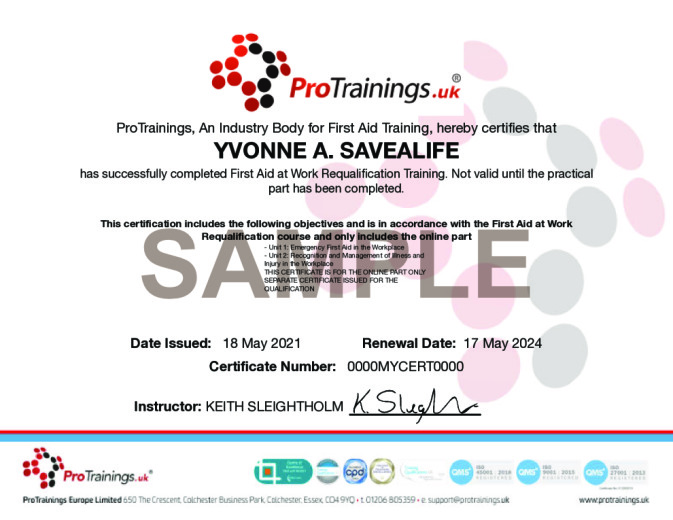 ProTrainings Vocational Training Qualifications (VTQ) are fully recognised by the HSE as Trade Body Qualifications.This course must be at least 12 contact hours and run over a minimum of 2 days and the certificate is valid for 3 years. This blended FAWR course meets all of the requirements under the HSE and Awarding Organisations and is available as a ProTrainings or Regulated Qualification. This course comes with 12.0 hours of CPD, although the time to complete the course online may be less than this. Total course time includes 5 hours and 43 minutes of video training as well as knowledge reviews, final test, remedial help and reviewing downloaded material.